spain | Miracle or Mirage? Spanish Solar Steep Slope inSanity! Spanish utility-scale solar developers apparently have little concern for the slopes upon which they build photovoltaic plants, resulting in absolutely insane, erosion-causing, likely self-endangering developments such as this one. A utility-scale solar facility in Spain built on an incredibly severe grade. American utility-scale solar developments have a variety of laws governing their permitting, chief amongst them our beloved National Environmental Policy Act of 1970 (NEPA), which requires rigorous environmental impact assessment on all proposals involving the federal government in any way. California, too has the California Environmental Quality Act (CEQA), passed just a few months after NEPA, which gives a similar level of scrutiny to state-only projects, as well as enhancing the level of NEPA’s review in many cases. One of the chief areas of impacts examined under NEPA/CEQA is impacts to soil resources and hydrology. Because building a facility like the one above will inevitably cause terrible erosion, by denuding the slopes of the vegetation which hold down their soil, utility-scale solar developers in California have been forced to limit the areas they can build to relatively flat places. For example, the Solar PEIS, BLM’s programmatic evaluation of solar on Public Lands in the southwest, excluded all areas with slopes greater than 5% from consideration for development. In practice, developers need even flatter areas. Ivanpah SEGS, which was able to built on a “steeper” slope of 1.7%, because it didn’t require wholesale grading of the site, is probably amongst the steeper that will ever be built in the U.S. [Link to EIS from BLM]. 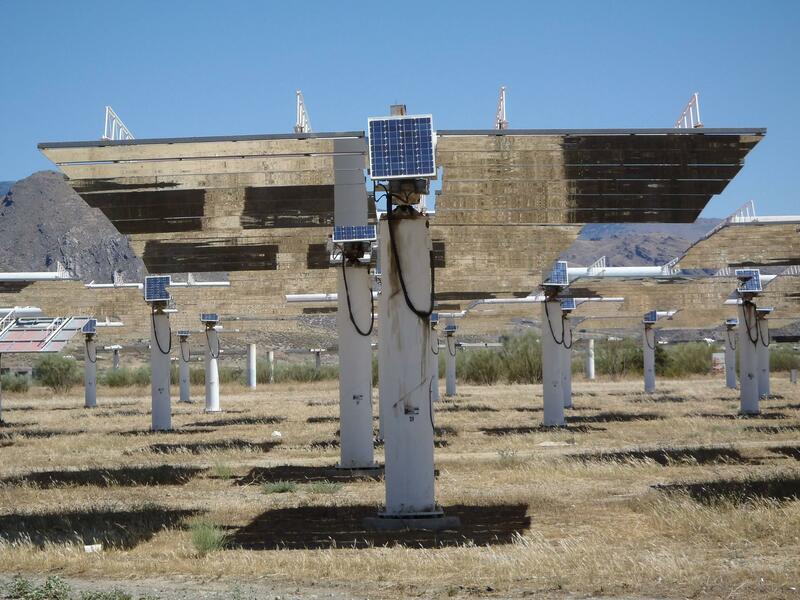 BLM’s own regs state that photovoltaics, like the Spanish sites pictured here, need to be sited at a 3% grade or less. Water diversion scheme for Genesis Solar Power Project, as depicted in the EIS. The alternative is to dramatically alter the native hydrology, as occurred with the Genesis Solar Power Project, a 250MW parabolic trough project sited near Desert Center, CA. [Link to the EIS from BLM; info from CEC; info from NREL.] In order to properly set up the troughs, they needed to grade the entire 1,950 acre site to a 1% or less grade, requiring the movement of over a million cubic yards of fill (picture a 1500 mile long convoy of standard sized dump trucks). But this of course, dramatically altered the local hydrology: to prevent a catastrophic flood, they had to build massive water diversion ditches, a schematic of which can be seen here. And still, during construction Genesis experienced what can only be described as a catastrophic flood. Spain’s environmental review process, on the other hand, is much more rudimentary. One of the things I’m focusing on this summer is getting my hands on Spanish EIS’s for utility-scale solar plants here, to compare the way they assess impacts, and how that may inform whether or not a plant gets built. Clearly, impacts to hydrology were not thoroughly considered with these facilities. 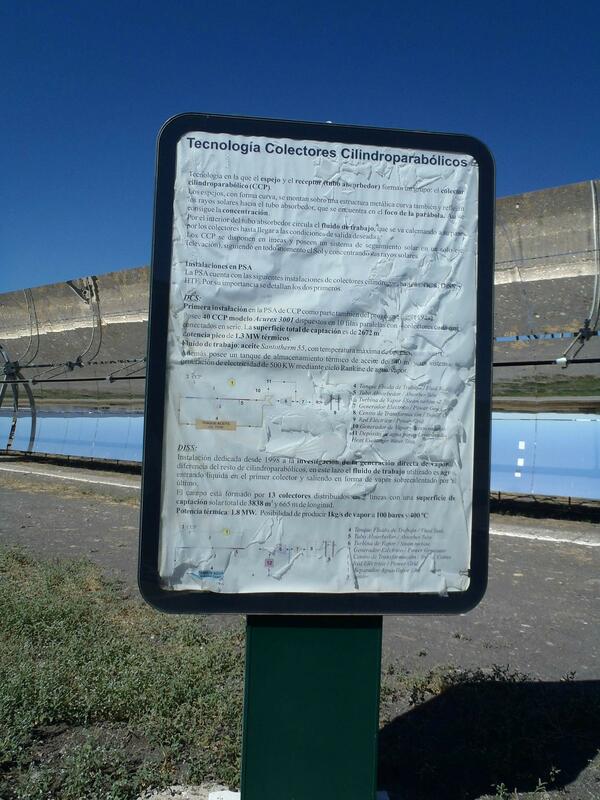 All the pictures come from a paper by Prof. Matías Mérida at the University of Málaga, in which he develops a typology of impacts from photovoltaic plants. I’ll write more about his typology in a future post. You can see the original Spanish version here [PDF, with pictures] or a crudely Google Translate-translated English version here [PDF, no pictures]. (Even so, Google Translate still seems like magic to me.) Unfortunately, I do not have a good source yet for which specific solar facilities these shots come from in Spain- I’m currently in correspondence with Prof. Mérida about it and will update this post when I find out. Still, just gaze in wonder, and be grateful that this is one particular problem that utility-scale solar watchers in the U.S. don’t have to contend with. This entry was posted in Blog and tagged design, EIA, grading, slope, spain, utility-scale solar on June 25, 2013 by Patrick Donnelly. It may have felt a bit like peering into the belly of the beast, but yesterday I had the rare opportunity to visit the Plataforma Solar de Almería (PSA), the Spanish government’s main utility-scale solar research facility, and the largest such facility in Europe. Political concerns about the siting of utility-scale solar facilities aside, it was truly fascinating from a history of technology viewpoint to see the evolution of solar thermal technology from the early ’80s to today. The earliest parabolic trough system on the planet, Accurex. Much smaller than current technologies, it also covered more ground. These are turned downward so the tubes don’t break in the sun. Screen grab from Google Maps of the Plataforma Solar de Almería. Clearly visible are several iterations of solar power tower, as well as parabolic trough and other technologies. The Plataforma Solar de Almería is in southeastern Andalucía, Spain’s sun-drenched southermost autonomía, in an area called the Desierto de Tabernas, the only desert in Europe (Google Maps link). According to worldclimate.com data, Almería, the local provincial capital (provinces in Spain are roughly analogous to counties in the U.S.) receives 8.8″ of rain per year, the very definition of a desert. According to the PSA staff, the Tabernas desert has over 3000 hours of good solar insolation per year. Considering that 4350 hours per year are at night, that’s a truly remarkable amount of sunlight for such relatively northern latitudes (at 37°N, it is roughly equivalent to San Francisco or the Central Plains in the U.S.- you gotta love the jet stream!). SSPS-CRS, the world’s first solar power tower facility, constructed in 1981. While facilities such as the early Luz plants in Israel (Luz went bankrupt and reformed itself as the now-industry-leading BrightSource Energy some years later) and the many Kramer Junction SEGSs in the Mojave Desert were innovators in concentrating solar thermal technology, they really owe their root technologies to the PSA. The PSA built the world’s first concentrating solar power tower AND the world’s first parabolic trough designs in 1981, further refining both technolgies during the remainder of the 1980s. Private enterprise has dominated such fields of technological innovation in the past few decades in the United States, but the PSA is fully funded by the Spanish Government, through its Centro de Investigaciones Energéticas, Medioambientales, y Tecnológicas (CIEMAT). It also collaborates with government research bodies from other European countries, notably Germany. Technologies are then leased or sold to private enterprises, through our tour guide was vague on fee structures and terms on such contracts. Parts of the PSA seemed like a veritable solar graveyard, as old or abandoned technologies slowly bleach in the sun. On to the technology! We got to view the world’s first solar power tower facility, the SSPS-CRS (the Small Solar Power System- Central Receiver System, weird that they gave it an English name and acronym), which amazingly was constructed over 30 years ago, in 1981. When used to generate power, it employed around 100 heliostats, each with an independent small PV cell to power their movement (check out the picture here), focusing their light on a 42m tall tower, creating a whopping 500kW of energy. In the intervening years, with its pioneering technology long eclipes, the SSPS-CRS has been used for fascinating research in the splitting of water and hydrocarbon molecules to generate free hydrogren atoms, with potential applications in artificial photosynthesis. The CESA-I, from 1983, a more refined solar power tower facility which resembles the modern technologies of today. A few years later in 1983, they upgraded this technology significantly, with the CESA I (I’m a bit ashamed to say I did not catch what this acronym stands for), a 84m tower with 300 heliostats, capable of generating 1.2MW. The CESA I bears much more resemblance to the towers which we know today, from plants in Spain, the United States, and elsewhere. [For especially nerdy readers who also can read Spanish, here’s a picture of the interpretive sign for the power towers.] Remarkably, it can generate temperatures of up to 1500°C (some 2700°F)! Compared to Ivanpah’s meager sounding 1050°F, this sounds very impressive. 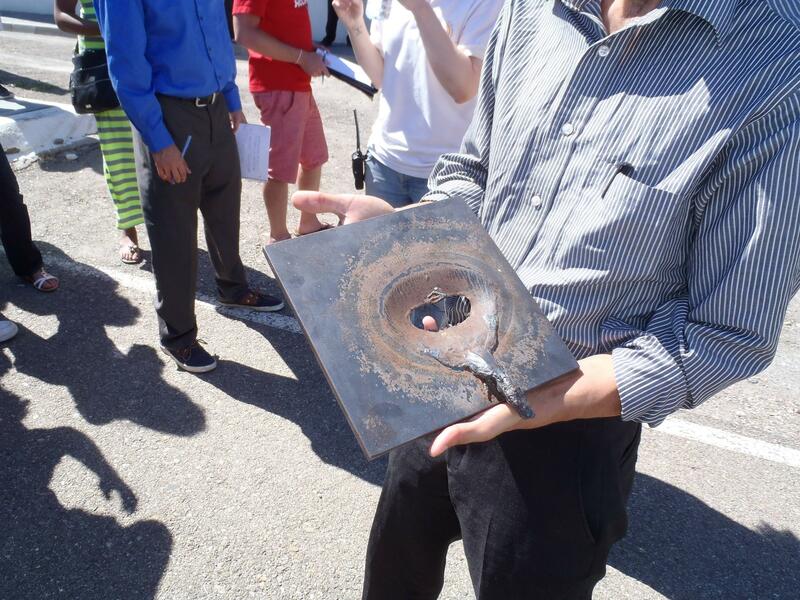 One would imagine that Ivanpah’s technology makes better use of the already high temperatures it has, such that temperatures hot enough to melt metal aren’t necessary (seriously, look at this picture). Various iterations of the Stirling Engine, the oldest to the left and most recent to the right, a technology that has yet to prove commercially viable at utility-scale. Solar power tower wasn’t the only technology on display at the PSA, though it was certainly the most impressive. 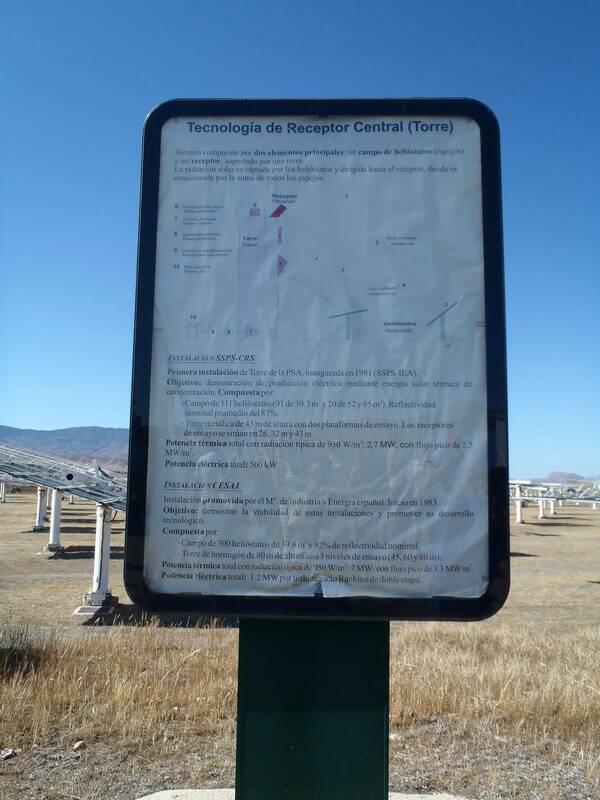 Early incarnations of parabolic trough designs, much smaller (just a few feet across), and more heavily concentrated, so that almost no sunlight reached the ground, were scattered about the site (Spanish parabolic trough interpretive sign). The entire evolution of the Stirling engine was also visible, from a black dish to a curved mirror system. And all around, like a graveyard of solar technologies, were decommissioned panels, troughs, cells, dishes, and every other possible incarnation of solar energy technology. And so it was a day at the Plataforma Solar de Almería to forget about politics for a minute, and simply enjoy the fascinating path of technological development over the past 30 years. The center focuses on technology, not siting, and thus is able to stay above the political fray. And perhaps the visit also offered some hope- if humanity, when properly motivated, can devise such ingenious and seemingly miraculous ways to transform sunlight into energy, surely we can find appropriate places to site such technologies. I left feeling optimistic, that utility-scale solar, if its siting and impacts are properly considered, could be a force for good in our future energy mix. Through a bit of research serendipity, my trip to Andalucía this summer happened to coincide with a field studies program from Arizona State University’s Consortium for Science, Policy & Outcomes and Global Technology and Development Program. They had thirty enthusiastic undergraduate and graduate students, who were touring many of the facilities I was interested in visiting, and were gracious enough to let me tag along. (Huge thanks are in order to Sharlissa Moore, a brilliant doctoral candidate at ASU who will be spending the next four months in Rabat, Morocco, doing field work for her dissertation on the DESERTEC project, amongst other solar intiatives in the MENA area). This entry was posted in Blog and tagged CSP, europe, parabolic trough, power tower, research, solar energy, spain, utility-scale solar on June 23, 2013 by Patrick Donnelly. Hello! Welcome to my new blog, “Miracle or Mirage? Tracking utility-scale solar around the globe.” This post is an introduction to my work. Please keep an eye on this space, as I’ll be updating frequently over the next few months with notes from the field. Large-scale solar energy facilities have been amongst the most visible incarnations of proposed solutions to the problem of global climate change. Beginning in the middle part of the 2000’s, a veritable gold rush of solar development began, as energy companies sought to cash in on lavish state subsidies while benefiting from legislation which mandated renewable energy production. As a result, landscapes in remote areas have been transformed, turning formerly pastoral areas or those largely unused by humans into industrialized energy production zones. Ivanpah Solar Energy Generating System, Mojave Desert, CA. For most people who have found this blog, this is an old story. However many Americans are unaware that the current utility-scale solar boom in the desert Southwest is not unique: Spain, for example, has a higher level of deployment both on per-capita and absolute bases. And indeed, they have experienced significant boom-and-bust cycles, as governmental market supports dissolved in the face of economic uncertainty. Utility-scale solar has also been deployed in Israel, Germany, South Africa, Morocco, India, and that is just the tip of the iceberg. In almost all cases, there have been significant government subsidies, legislative mandates, and market supports to promote utility-scale solar. Frequently these will also have deadlines for commencing production, meaning there is a rush for development. As a result of this rush to meet incentive deadlines, environmental review processes have often been expedited and/or forgone altogether. By the very nature of these facilities, their sheer size and internal intensity of development, land use patterns have changed. In some places, notably America and Morocco, this has meant development on previously undisturbed, largely “unused” areas. In other places, notably Spain and South Africa, this has meant displacement of agriculture. None of this is to cast an absolute value judgement on utility-scale solar projects. There are instances of “good” utility-scale solar projects, with adequate environmental review processes, appropriate siting, and thoroughly mitigated (or negligible) environmental impacts; just as there are instances of “bad” projects, with hurried and cursory environmental reviews, poor siting, and severe and unmitigatable environmental impacts. For my research summer, I have been awarded a Haas Scholars Research Fellowship from the University of California, Berkeley, to investigate policy-making processes and implementation of utility-scale solar projects in the United States, Spain, and Morocco. My goal is to conduct a comparative analysis of Spanish and U.S. policy, finding what similarities exist, and to extract some “lessons learned” from the Spanish experience, as their deployment of utility-scale solar has been several years ahead that in the United States. To read my abstract, you can click here [PDF]. In this space, I’ll be regularly posting portions of my field notes. This could be photos or descriptions from site visits to facilities in Spain, Morocco, and California; snippets from interviews with policy-makers or community members; particularly interesting tidbits from Environmental Impact Statements or solar-enabling legislation; or really anything else that comes down the pike as my investigations unfold. With my work this summer, I hope to draw a line in the sand. Utility-scale solar, if deployed in the correct way, could be a key facet of humanity’s response to the negative climate impacts of our energy consumption. However, as it currently stands, it appears in many ways to be a utility-scale boondoggle: sucking down government subsidies and fundamentally altering local environments, while ultimately showing negligible benefits to overall energy production patterns. Sensible policy reforms could promote sensible utility-scale solar deployment. And so, we’re off! I’m writing this post from a small apartment where I’m currently staying in Sevilla, in the south of Spain. I’ll spend this week trying to track down EIS’s and talking to people in the towns near the Solúcar Platform (depicted above). Please feel free to contact me either through this blog, or via email (donnellyshores AT berkeley DOT edu)- I’d love to hear from others who share my interest and passion in this topic. Until then… Saludos! This entry was posted in Blog and tagged Berkeley, EIA, energy policy, policy, solar energy, spain, U.S., utility-scale solar on June 17, 2013 by Patrick Donnelly. The Silurian Valley spared- but will it be conserved? F on Spanish Solar Steep Slope inSanity!